E.dams Renault driver Sebastien Buemi of Switzerland won from pole in the Formula E Beijing ePrix auto race at the Olympic Park in Beijing on Saturday. Sebastien Buemi dominated the weekend on the streets of Beijing as the FIA Formula E series returned for its second season. The Swiss driver led the field away for 26 laps around the circuit while Mahindra’s Nick Heidfeld went by Buemi’s teammate Nico Prost for second at the start. Prost then overshot a corner on Lap 2 and gave up the third spot to Lucas Di Grassi. The race was slowed twice for incidents as the newly implemented Full Course Yellow came into effect where the field all had to slow down to 50 kph until the incident was cleared. The first came on Lap 3 when Simona de Silvestro crashed into a wall, with the team reporting on Twitter that she was hit from behind, while the second came at a more critical time when Antonio Felix da Costa and Jacques Villeneuve got together on Lap 14, just after most of the field had pitted. The five drivers who had not pitted were Loic Duval, Jerome d’Ambrosio, Oliver Turvey, Nathanael Berthon and Nelson Piquet Jr., who all benefited from the timing of the Full Course Yellow. Additionally for Turvey and Piquet, as well as Sam Bird, they had won FanBoost. However, it was a race to forget for Piquet as his underperforming NEXTEV TCR machine saw him grid up 18th and finish two laps down in 15th. Meanwhile up front, Nick Heidfeld had a slow stop and relinquished second to Di Grassi and third to Prost, although he traded places back and forth with the latter until Prost began to pull away in the closing stages. Heidfeld had the last laugh though when Prost’s rear wing began to fall off in the closing laps and he was given a black flag and forced to pit. With points out of the question, the Frenchman brought it in to retire. Despite the two Full Course Yellows, Sebastien Buemi was able to pull out a margin of victory of over 11 seconds to Di Grassi when the checkered flag fell, while Heidfeld was able to hold off the hard-charging Dragon Racing teammates of Duval and d’Ambrosio for third. 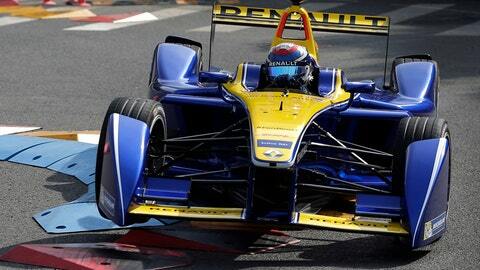 Formula E will be back in action in two weeks time in Malaysia for the Putrajaya ePrix. *Daniel Abt crossed the line in ninth but was given a 10-second time penalty for an unsafe pit release.